Now that my kitchen has gone green (using natural cleaning products and no paper products) I wondered what I should do when I have a super-messy mess. Like today for instance, when I dropped a raw egg on the counter instead of cracking it into the bowl (the kids distracted me). I remembered reading about the power of natural disinfectants on the Green Guide. Since I had anticipated this moment, I had recently picked up 2 empty spray bottles at the store. I followed the Green Guide's advice and used vinegar and peroxide to disinfect the counter. I wiped it up with a sponge, which I then put in the dishwasher to sanitize. "a combination of 3 percent hydrogen peroxide (the same strength you find at the drugstore) and undiluted white or apple cider vinegar. 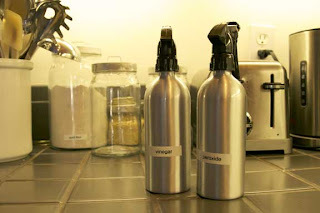 Put the two in separate spray bottles and spray one immediately after the other. You can spray it directly on fruits and vegetables and also on surfaces, such as cutting boards and countertops." Very handy to know. I'm curious where you get the metal spray containers, though. We're trying to replace our plastics when they wear out/break with non-plastics. I found those spray bottles at The Container Store. I don't see them on the website though, so I didn't link to them. I found them in the store near all the cleaning and laundry items. Hope that helps! Maybe a bed and bath store would have them, too? I have been trying to find something to replace Lysol that you can spray on anything? Any suggestions?